Once every year or so, when finances and schedules permit, your editor and a couple of his similarly-obsessed radio pals get together to spend a week or so exploring a corner of our great nation, packing our schedules as full as possible to visit as many interesting broadcast facilities as we can. And then, a few months later, once we've caught our breath (and some much-needed sleep), we share it all with you here on Tower Site of the Week (and in audio form over on Tophour.com) in a feature we call "The Big Trip." 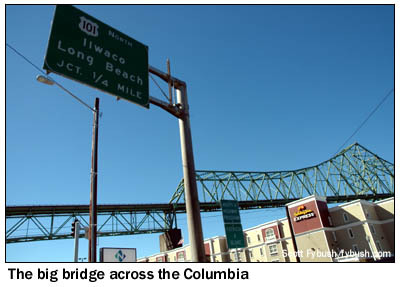 The 2006 version of the Big Trip began and ended in Seattle, and along the way took us as far south as Eugene, Oregon and as far east as Coeur d'Alene, Idaho. The third morning of the Big Trip dawned warm and sunny in our hotel room in Seaside, Oregon, the spot where Lewis and Clark ended their historic journey two centuries and a few months earlier. We're here not for the scenery (though it's awfully nice), but for the International Radio Club of America's annual convention, where medium-wave DXers (mostly from the western U.S., with a nice representation from western Canada, as well) gather to talk about their hobby, share their experiences and tips, and just enjoy the company of others who don't think it's weird to spend hours next to a radio tuned to "static." These conventions (this year's takes place in Salt Lake City in late August, just a week before the National Radio Club and the Worldwide TV-FM DX Association hold a joint convention 300 miles away in Boise - hmm...another Big Trip in the works?) frequently include tours of radio stations, and while we've missed out on a Friday-afternoon visit to Seaside's local stations, KSWB (840) and KCBZ (94.9 Cannon Beach), we're ready to go for the Saturday morning event, a drive 20 miles north along the coast to Astoria and the cluster of stations owned by New Northwest Broadcasting. 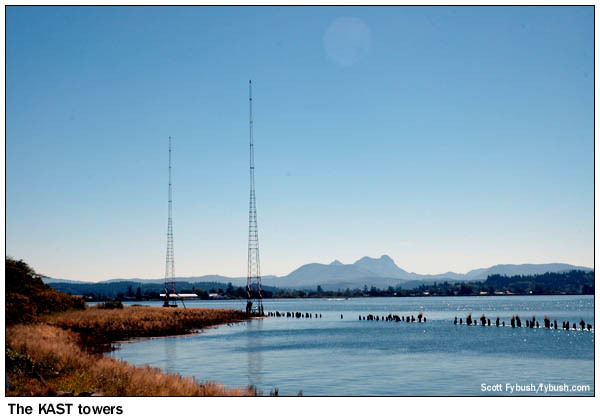 The studios are in the building along Youngs Bay that's also the transmitter site for the city's oldest station, KAST (1370) - and, yes, that shot of the towers in the water at the top of the page will surely show up in a future Tower Site Calendar. 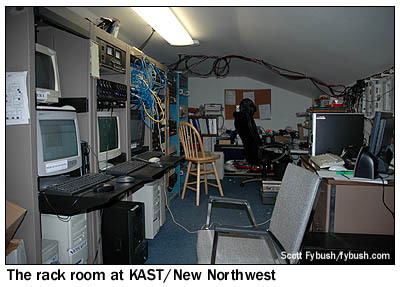 Today, the KAST building is home to two AM stations and three FMs, all sharing studio space up on the second floor, which is also home to a crowded rack room in the attic. 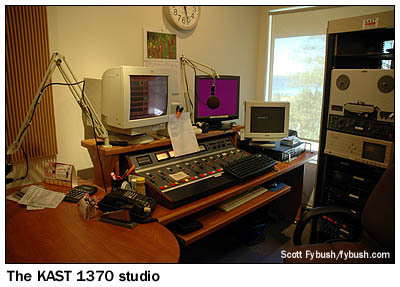 In addition to KAST, which does news and talk (including a local gardening show that's going on as we arrive), there's KKEE (1230 Astoria), which has ESPN sports and a local weekday afternoon show; KAST-FM (99.7 Long Beach WA), with soft rock; KCRX-FM (102.3 Seaside), with classic rock; and KVAS (103.9 Ilwaco WA), with "Eagle" country. On this Saturday morning, they're all running on automation, except for the gardening show on KAST, so our group has the building nearly to itself as we explore the studios, then head downstairs to see the sales offices on the first floor, which is also home to an old Sparta that's KAST's backup transmitter and a more recent Gates One, in a little sunroom out back, that's now the main transmitter. 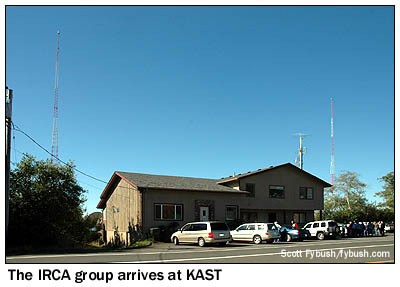 A couple of quick bits of history here before we move along - KAST(AM) traces its history back to 1922 and a station called KFJI. 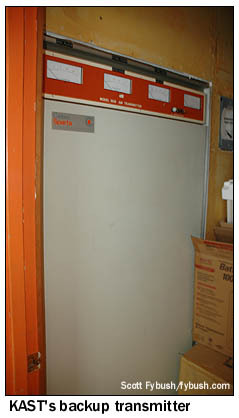 By the 1930s, it had taken the KAST calls and settled down on 1370, which was then a 250-watt local channel. 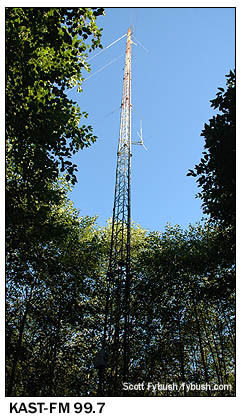 But in the big NARBA frequency shift of 1941, KAST somehow ended up not on 1400, with the rest of the former 1370s, but on 1230, where it spent most of the forties before getting a power boost to 1 kW, DA-N, back on its former frequency of 1370. 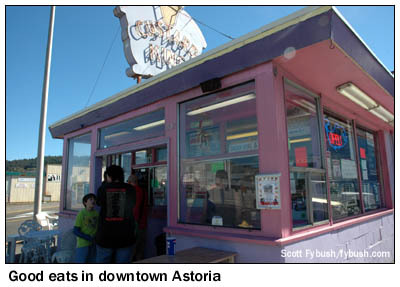 1230 then came back on the air in Astoria in the early fifties as KVAS, the calls now on 103.9. 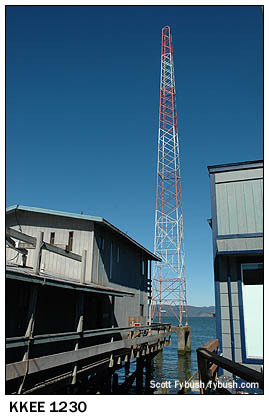 The present KKEE 1230 tower, sitting right on the edge of town on piers in the mouth of Columbia River, certainly dates back to the KVAS days (our convention host, Patrick Martin, worked there back then) - could this have been the old KAST 1230 tower before that? It looks old enough, anyway. 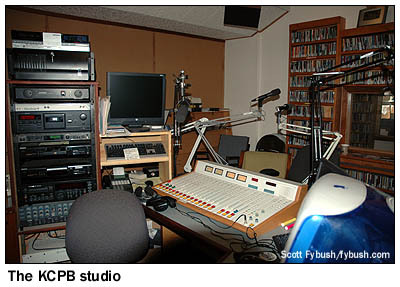 The second station, which just signed on a year or so before our visit, is KCPB (90.9 Warrenton), which carries a mostly-automated schedule of NPR and BBC news and classical music that nicely complements the diverse KMUN/KTCB lineup. 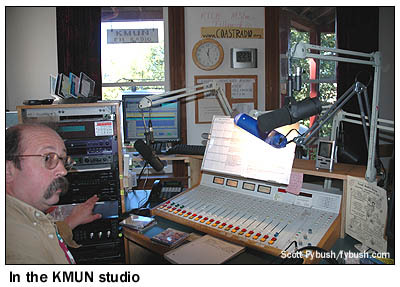 Our next stop this Saturday afternoon is at our host Patrick Martin's house/DX listening post down the coast, north of Seaside, where we see the medium-wave setup that allows him to log some incredible trans-Pacific catches on a regular basis, as well as the lineup of satellite dishes from which he monitors the world. But before we leave Astoria, we look up admiringly at the huge bridge that carries US 101 across the Columbia to Washington State, and the next day we start off heading back north from Seaside to cross the bridge and check out one FM tower on the Washington side, what's now KAST-FM (99.7 Long Beach), up near Ilwaco on the coast. Our Saturday concludes back at the convention hotel in Seaside, where there's an afternoon schedule full of interesting talks on arcane DX topics like listening from central Alberta, computer-aided receivers, and some guy talking about "Radio Towers I've Known and Photographed," followed by a nice group dinner and plenty of conversation late into the evening. After a detour north to see the KAST-FM tower, we head south again through Seaside, then north again as we realize, a few miles past the town center, that we'd completely forgotten to check out the Seaside AM station itself, just a quarter of a mile off the east side of US 101 on the south end of Astoria. 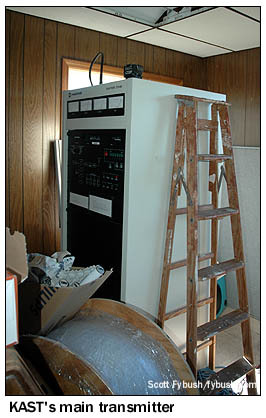 KSWB (840) started out in 1968 as a kilowatt daytimer on 930 before sliding down the dial to fulltime status on 840, where it now runs 1000 watts day, 500 watts night with an oldies format. 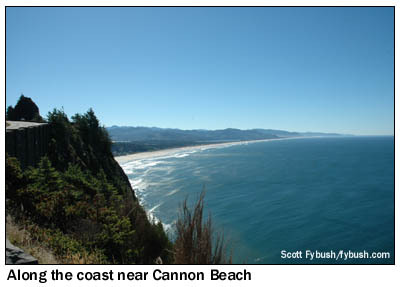 On the other side of 101, a mile or so south of KSWB, Rippet Mountain rises between the highway and the ocean, and somewhere up there are the antennas for KSWB's sister station KCBZ (94.9 Cannon Beach), as well as New Northwest's KCRX-FM (102.3 Seaside) and another standalone FM, country KCYS (98.1 Seaside). 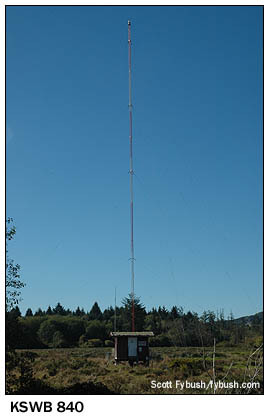 Tillamook's radio stations sit a mile or so west of downtown, where Netarts Road crosses the Tillamook River. 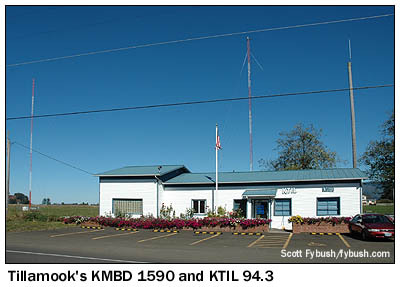 KMBD (1590) is all satellite talk, while KTIL-FM plays standards. 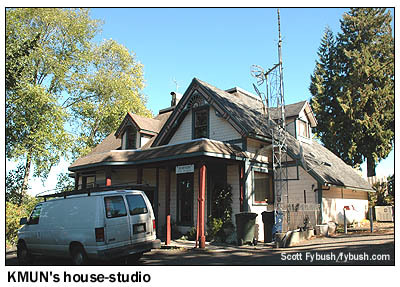 It, too, was part of the big frequency shuffle of early 2006, moving from 94.1 to 94.3 to make room for KPDQ-FM in Portland to go from 93.7 to 93.9, which made room for the former KAST-FM on 92.9 in Astoria to go to the Portland market as 93.1 in Gladstone...but we'll get there soon enough. Actually, we'll get there in just a couple of hours, as we turn inland on Route 6 for a zippy drive up to US 26 and east to Portland and a jam-packed afternoon of tower hunting. Join us here again in just one week as we begin recounting our adventures in Oregon's largest city, and join us over at Tophour.com starting Wednesday, March 7 to hear a bunch of legal IDs from all these stations. Thanks to New Northwest Broadcasters operations manager Tom Freel and KMUN's Kevin Palo for the tours, and to Patrick Martin and everyone involved in putting on a fine IRCA convention! The Tower Site Calendar 2007 is here! They're about to sell out, just like 2006 did - order today at the Fybush.com Store!